As you may know last year I won the MFC / OBN fly designer contest. Well, it looks official, my Primordial Crust Carp Fly (and yes that was the very first Fly-Carpin post) is now available from Montana Fly Company. If you would like to try it out you can either order some from an online shop such as Dreamdrift Flies or ask your local shop to pretty please order some. Check out the sweet rotating 360 degree picture from MFC. I myself have some waiting for me at Colorado Skies fly shop. This is actually my second order, the first one got put on the floor on accident and sold out, which is pretty cool! 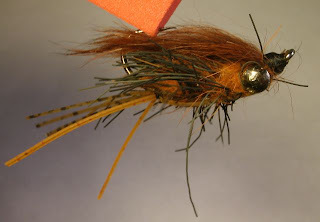 Its getting to be the time of year when a meaty fly like the Crust can really shine for big fish. Two of my biggest fish last year came in the spring on a Crust. Not an expert, but the Crust seems to work for Trout too. 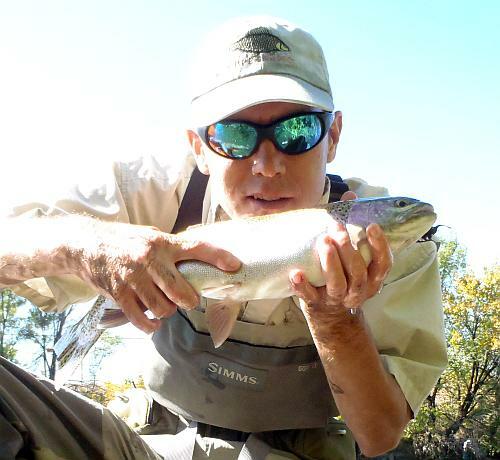 In an ironic twist the only two Trout I have caught on the DSP were both around 18", caught in the fall and fell to a Crust "carp fly" on a blind swing through shadowed runs. In case you haven't noticed I am pretty carp-centric these days so I have not actually tried it for Bass. I have no doubt that the Crust is a worthy bucket-mouth fly as well though. Sweet. Definitely gonna be a row of those in my carpin' fly box. Ty - Warning Will Robinson, this is the heaviest and meatiest fly I use. Would be more likely to catch your stripers or LMB than the super-shallow paranoid schitzo carp you have around there! Yup, that's a good point McTage. Those carp probably wouldn't tolerate rhat big fly very well. But I have some new potential carp water I'll be checking out soon. Big ol' meaty flies just might be the ticket there. We'll see soon. Congrats, I plan to order up some. Cool Lonny. From what I know by reputation of the carp in your area of the front range they are a likely target. 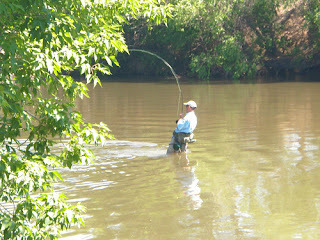 I think you fish stillwater mostly, like I told Ty, this is a heavy meat fly. Look to this fly for deeper carp, cruisers and carp where you can get close enough to cast away from the carp and bring it to them on the strip or on a drag and drop presentation. Excellent tips McTage, thank you. I have the Primordial Stew from the Fly swap but I don't want to loose it so I will try to make a few myself. Thanks again. The Carp-stew you have copy from the swap of is a smaller, lighter and more general pattern than the crust. Slightly heavier than a backstabber to overcome the drag but fishes similar. Yep, too cool to have a carp fly you designed yourself and have it work, and then be marketable. Same as Lonny, unless I have sighted close carp I am not going to lose that fly, tie some up some myself, or, actually buy some which is rare for me. Ty, lost your fly 2 weeks ago to a tree I knew was behind me, damn, I was excited and it was the ONLY small fly I had to throw at sub surface midging carp on #22-24 pupa. Normally I'd have my trout small midge box but I've been gently chided for carrying too many flies. Bad cut back! Thanks Gregg. It is pretty fun. I haven't lost any yet but I have been pretty carefull. Of course, being carefull isnt helping catching fish on them! As soon as I get caught up on my own flies I am gonna tie up a couple of copies of my faves from the swap and really work em. Thanks Jean-Paul. 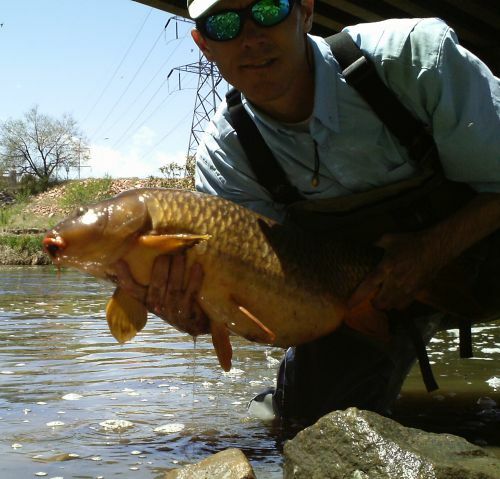 I gotta get around to putting in a carp-crack order. I like that 18lb primordial Carp shot...that must have been an amazing photographer who took that one ;) We need to get out soon for some Carpin! Hmmm....I am trying to remember. I think maybe I gave my camera to a homeless guy for that shot? Oh yeah, that was you! I agree though, it was a good one and I will drop you a line. Updated the post.